Diabetes is among the most common disorders in the world today. Despite various researches done and precautions taken, one cannot predict who will suffer from diabetes. Depending on the type and severity, every diabetic patient should be given medications. Here are a few natural remedies that can be helpful in reducing the sugar levels in a diabetic patient. Fig Leaves- Figs leaves are very commonly used in treating diabetes. They are believed to have anti-diabetic properties that help them to reduce the sugar levels in the blood. Fig leaves can be directly chewed on an empty stomach, or the leaves can be boiled in water and the water can be drunk like tea. Done on a regular basis, the need for insulin gets reduced. Fenugreek- Fenugreek seeds are rich in sugar-lowering properties. Even the leaves of this plant can be made as curry and consumed regularly. Fenugreek helps to reduce the insulin dependency when taken in regular intervals. A teaspoon-full of seeds should be soaked in a glass of water over night and the water along with the seeds should be drunk on empty stomach. No foods or medications should be taken for the next 30 minutes after consuming the water. This treatment is recommended for 2 – 3 times per week. Cinnamon- Cinnamon is the common spice used in every Indian cooking. The taste and the aroma enhancer also has beneficial anti-diabetic properties where it is believed to have the same properties like insulin in lowering the blood glucose level. It is recommended to take half spoon of cinnamon powder everyday to get the desired effect. It can also be chewed in its natural form instead of being made into a powder. Grape Seed Extract- Grape seeds are a rich source of vitamin E, flavonoids, linoleic acid and oligomeric proanthocyanidins. 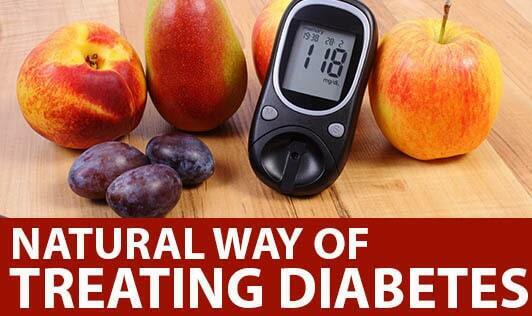 Recent studies have proved their efficacy in treating diabetes. The grape seeds are ground and placed in capsules; the person can take up to 300mg per day to reduce the blood sugar levels. Olive Oil- Olive oil is believed to have beneficiary effects such as reducing the cholesterol and triglycerides level in the blood. It also helps to reduce blood sugar level. Cooking all foods with edible olive oil brings about this effect on the long run. Bitter Melon / Bitter Gourd- Bitter gourd is an ancient remedy to treat diabetes at home. It can be taken in the form of juice, or cooked and fried and consumed with food daily. Many prefer drinking the stock after boiling the bitter gourd. The best effects can be gained when taken on empty stomach every morning. Be cautious while taking bitter gourd as it can even lead to hypoglycemia or low blood sugar levels. Vitamin C- Wondering why vitamin C is used for diabetes? Recent researches have found that consuming up to 600mg of vitamin C daily can help to normalize the blood glucose levels. Foods rich in vitamin C should be consumed daily by chronic diabetics. Garlic- This is a common Indian herb known to every Indian family that is extensively used in everyday cooking. Everyone is aware of the cholesterol-reducing effect of garlic; few people know about its anti-diabetic effect. The chemical Allicin in garlic is believed to have hypoglycemic effects. Aloe Vera- This is a very common plant grown in most households. It has varied benefits and uses for the human body. Widely used for the cosmetic property, it also has hypoglycemic characteristics. It has a slight bitter taste, yet has proven to reduce the sugar levels. It also has anti-inflammatory properties that promote wound healing. It is best taken with buttermilk to improve the taste. Neem- Neem, a tree that is believed to have anti-bacterial and anti-fungal property, has anti-diabetic properties as well. It has been found to reduce insulin requirements by up to 50%. Amla (Indian Gooseberry)- The common man’s fruit that is rich in vitamin C also has hypoglycemic properties. The fruit when taken orally helps to reduce the sugar level by stimulating insulin production within 30 minutes of consumption. The seeds of this fruit are also taken in ground and powdered form, which has much slower effect in reducing the blood glucose levels. Mango- The leaves of the mango tree are believed to have anti-diabetic properties. The leaf extracts need to be administered at least 60 minutes before food consumption then only the desired effect can be seen. It helps to reduce the intestinal glucose absorption, which is the reason behind its anti-diabetic effect. Tulsi (Holy Basil)- This is a medicinal plant, which is also considered holy by many Indians right from ancient times. It is recommended to extract the juice from the leaves and consume it. A daily habit of eating fresh leaves from the garden after washing has tremendous effects on the body. Basil leaves bring about a significant reduction in the blood glucose level. Apart from that, this leaf also has anti-stress, anti-asthmatic, anti-bacterial, anti-fungal, gastric anti-ulcer, anti-oxidant, anti-viral, anti-tumor, anti-mutagenic and immuno-stimulant properties. Lady's Finger- This most sought out vegetable is rich in soluble fibers. It helps to slow down the absorption of glucose from the intestine. Soak one lady's finger slit in the middle in a glass of water overnight and consume it on an empty stomach. Done over a month, it reduces the blood glucose level to a great extent. Beans- Beans help to slow down the digestion process thereby preventing the rise in blood glucose level. Beans give a feeling of fullness to the stomach and satiety is reached early. Soy- Soy is a blessing for those having unmanageable chronic diabetes. Soy contains isoflavones that help to reduce blood sugar levels while keeping the body well nourished. It also prevents the accumulation of fat as it gives very little calories. It is ideal for weight reduction program too. Jamun- This is a seasonal berry that is not available all through the year. The leaves of the Jamun tree are useful in reducing the sugar levels. 100 grams of this fruit consumed per day can do wonders to the blood glucose levels. Caution – many tend to develop sore throat after consuming Jamun. Vinegar- Many may not include vinegar in their regular diet. But this again helps diabetics to reduce the sugar concentration in the blood. Add vinegar to foods that can be palatable with this ingredient. Two spoons of vinegar before food helps in the reduction of glucose influx. Papaya- It is recommended to consume papaya on a daily basis as it has natural blood sugar controlling capability that helps to control diabetes by and large. It is also a rich source of vitamin C and anti-oxidants along with carotenes and flavonoids.